As Frederick City Residents Head to Polls for this Month’s Primary Election, Who are the Candidates Jockeying for Your Attention … and Votes? Mayor Randy McClement sits back in a chair near the end of the ornately carved dark cherry conference table in his expansive office in City Hall and shakes his head, perplexed at why he’s the target of criticisms leading into this month’s primaries. “I have done the best I can do to be both transparent and efficient,” he says. His voice nearly echoes in the quiet of the closed room as he pauses to reflect. Voters once commended the 56-year-old Republican for his easygoing demeanor as a longtime owner of a Downtown bagel shop. Supporters welcomed his friendly nature and calm businesslike approach as a refreshing contrast to a more confrontational style of some of his predecessors. And some observers maintain his day-to-day managerial style has been appropriate during an uncertain economy. 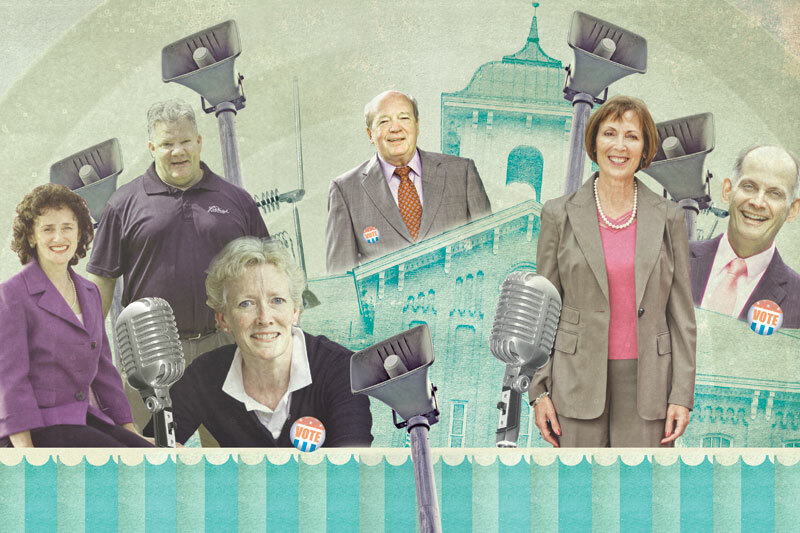 “One might argue that what we went through financially was a good time to have a good manager rather than one who has some grand vision,” says Ed Robinson, a city resident who leads the Entrepreneurial Council and Downtown Frederick Partnership.